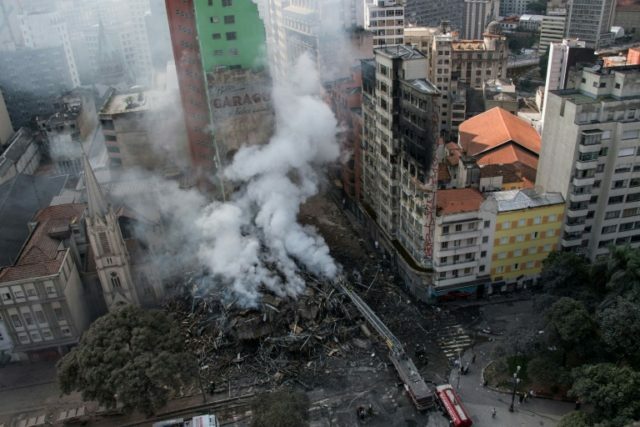 Sao Paulo (AFP) – Forty-four people were listed as still missing Wednesday after a 24-storey building used by squatters in central Sao Paulo was engulfed in fire and collapsed, the Brazilian city’s fire department said. In the immediate aftermath of the disaster on Tuesday only three were unaccounted for, including one man who was seconds from being successfully rescued by firefighters before the building suddenly crashed down. “The fire department is continuing to search, currently with 31 vehicles, 78 firefighters,” the department tweeted. There was no indication whether the large number of missing were considered likely to have been killed and buried under the rubble, or whether they simply were not there at the time. The building, a disused former police headquarters, was occupied by 146 homeless families, officials say, blaming lack of even basic fire prevention measures for the accident. Officials have not given a specific cause for the blaze. Sao Paulo is Brazil’s financial capital and the most populous city in Latin America, but suffers huge economic inequality. Poor families often squat in disused buildings or set up tents and shacks on vacant land, sometimes next to wealthy areas. President Michel Temer, who is Brazil’s most unpopular leader on record, with single-digit approval ratings, got a hostile reception when he briefly visited the scene. “We want housing!” a crowd chanted before he hurriedly left.